Class Opener – Day 12 – How Big is Big? Many students ignored the exclamation point right off the bat, giving replies like “it’s a little bigger than 51”, or “pretty big”, until a student realized that I clearly meant factorial here. This genrated classroom discussion about what factorial meant, and some side discussion about how big a number this could be, including some calculator experimentation. We’re off to a good start! But just HOW big is this number? 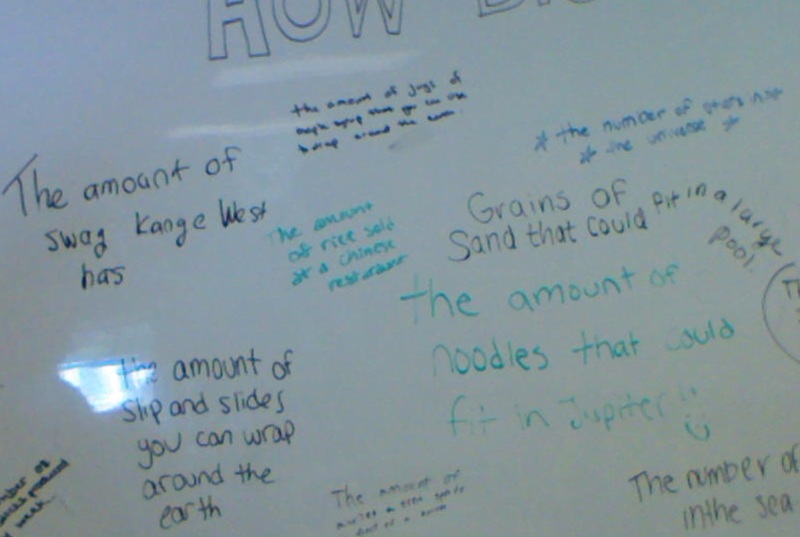 To get students thinking, I asked them to consider what a quantity that big could represent, being as creative (within reason) as they like. Some of the responses were awesome fun. Did you know Kanye had THAT much swag? To finish this opener, I played one of my favorite clips: from the British panel show QI, Steven Fry uses a simple deck of cards to do something never before done by man! I’ve dicsussed this clip on the blog in the past, so visit there for more info regarding this card shuffling experiment. Enjoy. Class Opener – Day 11 – the Sequence that Pays! Those are all odd numbers. What’s with the dollar signs? Are they all prime? How can we tell? Many students remembered the “trick” for determining if a number is a multiple of 3, but how do we check 8191? Maybe 13 or 17 goes into it, or some other funky prime. But once we establish they are prime, what’s special about THESE primes. I let this sequence marinate for a bit as I continued instruction, and eventually offered a hint. Add 1 to each number in the sequence. So true! But what is special about these powers of 2, and why did I exclude others? The big reveal here is that the numbers shown at the start are Mersenne Primes: primes of the form shown on the right, where P is also prime. And the Great Internet Mersenne Prime Search provides an opportunity for the amateur mathematician to participate in a quest to find bigger and bigger Mersenne Primes, and perhaps score a cash prize for your effort! Visit the GIMPS site for more information about the search, and the current status of the project, where the largest prime found boast over 17 million digits. While many in the class wondered why anyone would care about such primes (we will discuss codebreaking later our course when dealing with Matrices), others seemed intrigued by the pattern. And as we begin to discuss counting priniciples and large numbers tomorrow, this was a neat way to foreshadow. Finally, I want to live someplace which values math so much that they put math on their postage, that would be cool…. After a probability quiz on Friday, students were given a problem to tackle and finish for homework. The problem, Come Fly With Me (shared below), features many overlapping events which students need to process. Ideally, the problem is best summarized using a Venn diagram, though certainly other methods can be used to reason it out. If I buy a sandwich with bacon and sausage, where should I place my name? 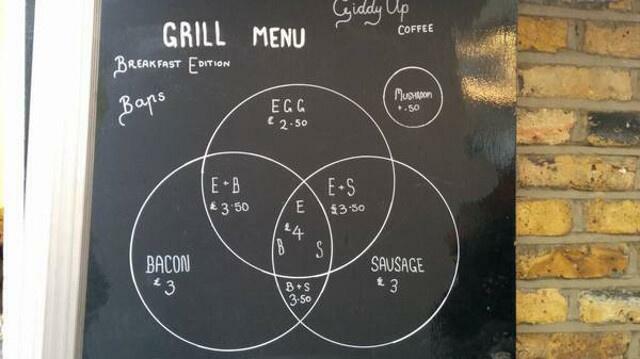 Should I place my name in the bacon only space, as I am getting bacon? How about sausage? And how do we feel about the placement of that mushroom circle? 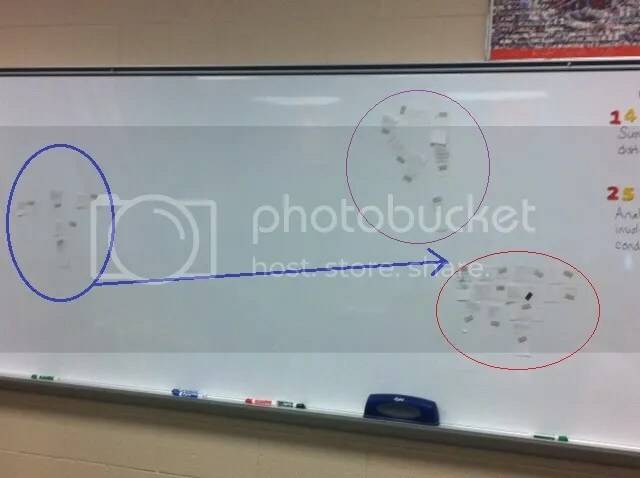 Now it’s time to go over the “Come Fly With Me” problem, given below, and find out if the class absorbed anything from our brief Venn discussion. 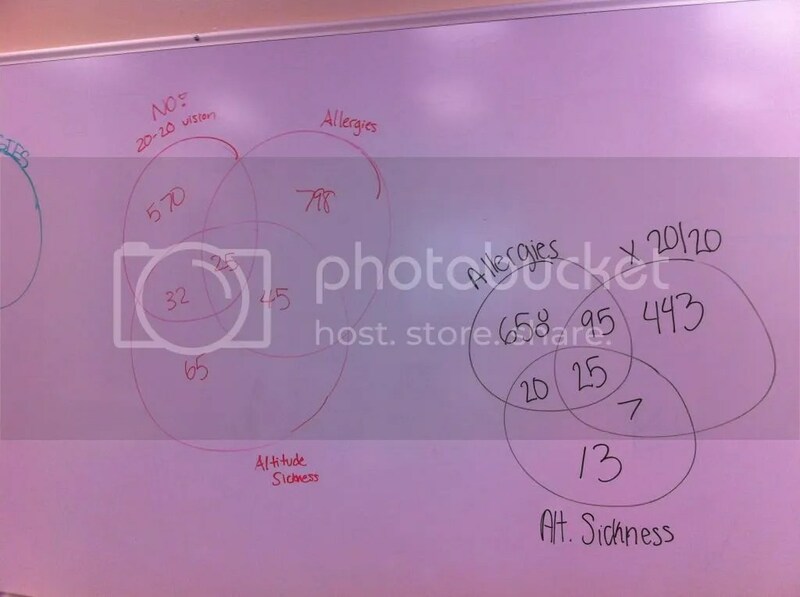 So, did our opening discussion help students use Venn Diagrams more effectively? 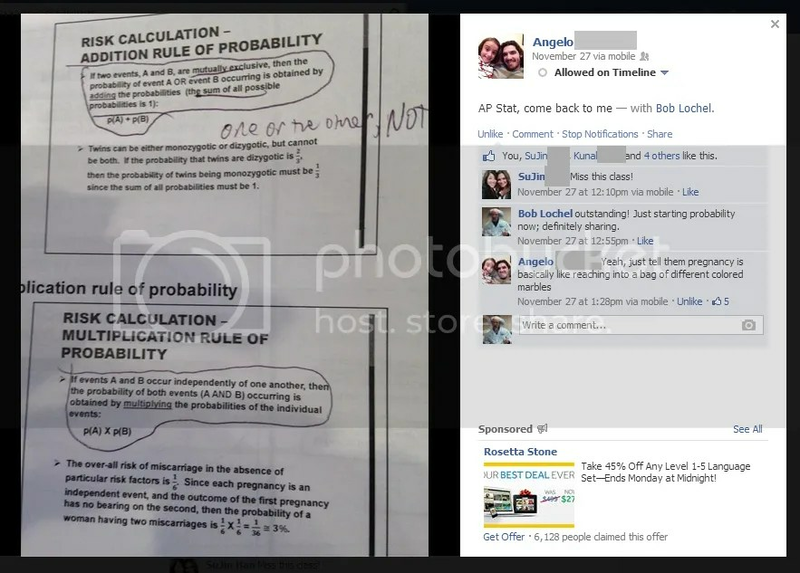 Results are mixed, as some groups altered their assignment based on the discussion, while others kept the numbers as they were. But hopefully a few students were reminded of the power of these organizational tools. Just tell them that pregnancy is basically like reaching into a bag of different colored marbles. Message received and relayed. Thanks Angelo! Can it really be 13 years since the Twin Towers were attacked? I clearly recall my old classroom, where a teacher across the hall told me I needed to turn on CNN. Now the students in front of me today have little recollection of that day: they were 1 or 2 years old. But they are all familiar with the day’s events, and I hope today’s opener brings some math context to this awful day. I shared my post on Meaningful Adjacencies, the method used to arrange the names on the 9/11 Memorial, both online and during a “My Favorites” session at Twitter Math Camp this summer. And I am thrilled that many contacted me this week looking for resources and information. 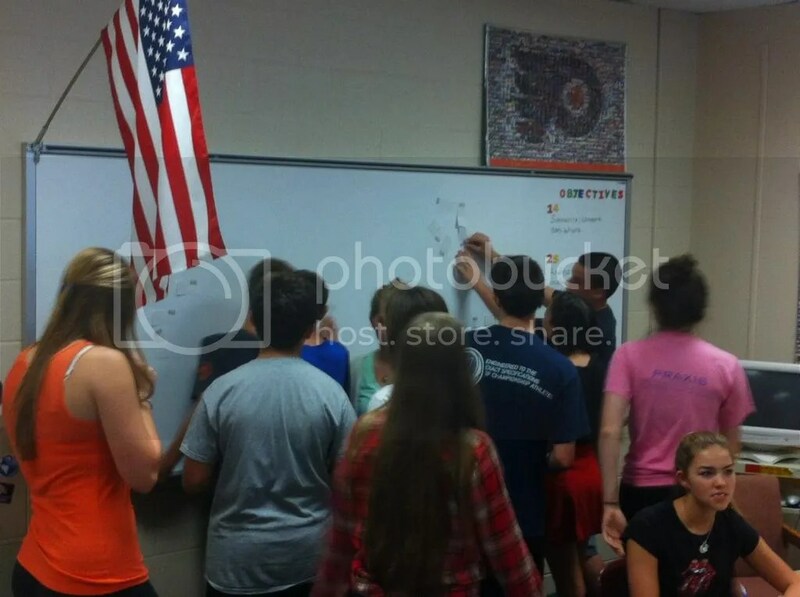 In the activity, students are asked to list their 5 favorite TV shows on a card, then appraoch the board. Their task is to connect with classmates, and placee their card so that people with similar interests are as close as possible to each other. After they have completed the board, I show a video which demonstrates parallels between this activity and the arrangement of names on the WTC Memorial. One of my classes organized themselves into 3 “pods”, thinking that their interests were isolated. But by finding “Family Guy” as a shared interest, we can challenge small pods to come together and embrace similarities. September 11 will never be an easy day, but having this activity to share with kids and think about the important task of memorializing those fallen makes it special. How many of you think the answer is A? A few tentative hands rise. 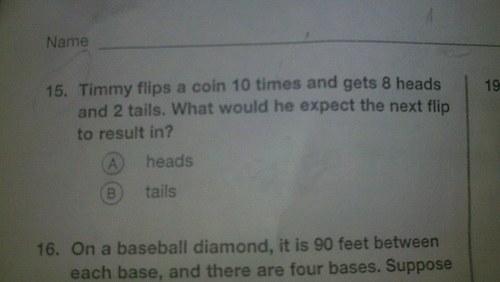 How many of you think the answer is B? More hands, yet still uneasiness. How many of you think this question is just plain stupid? Our school is about 90 minutes away from Atlantic City, and when our staff was younger we would take semi-regular bus trips to the gambling mecca for a night to let off steam and enjoy some beverages together. Stand in the center of the roulette table area. Often there are 4 or 5 tables together. Observe the board results. Locate a table which has had a “run” of a particular color; 4 or more of the same color. Realizing my colleague’s strategy was full of holes, I was interested to see the theory of “run” put to the test. We located a table where there had been 5 red results in a row. Time to make a profit! $10 on black….spin, spin, spin…..RED! $20 on black…spin, spin, spin…..RED! $40 on black….spin, spin, spin…..RED! $80 on black…spin, spin, spin…..RED! And then we left the casino floor…$150 poorer yet with a valuable probability lesson behind us! The odds are one in a thousand just to catch one foul ball at any give game, according to ESPN Stats & Information. So what are the odds of one person catching four at a single game? A cool one in a trillion, or simply a great day in Cleveland. Pretty long odds. Almost suspiciously long. 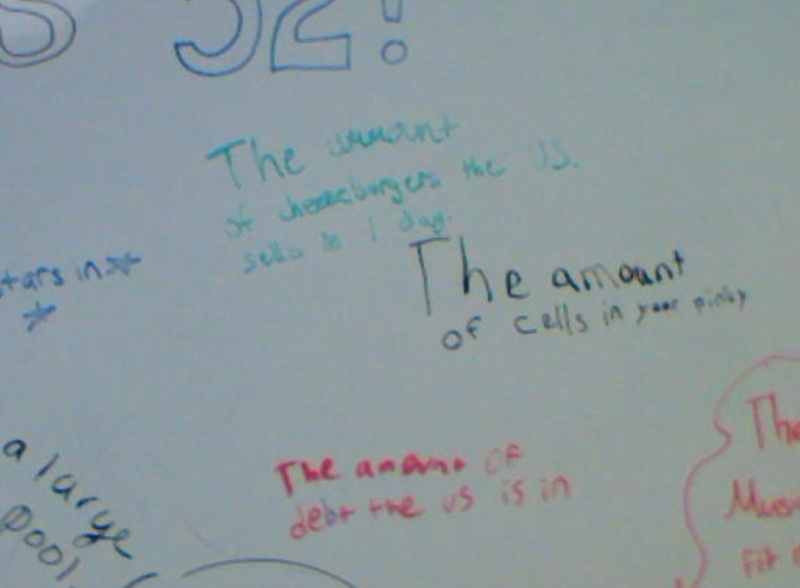 After students looked over this arguement, I asked them how many of them had caught foul balls at a baseball game before. Where did they sit? I was behind home plate. I was near third base. I was in the upper level near first base. Few people from the top sections, the outfield (where clearly a foul ball would not be an issue), and some other goofy sections ever have a chance at a foul ball. This led to general agreement that some sections are “ideal” for catching foul balls, while others are not so great. It appears that our Cleveland friend was probably sitting in one of the “hot” sections. The cool site IdealSeat provides heat maps for a number of MLB stadiums, showing you where to sit in order to optimize our chances of catching a baseball. Based on this evidence, is it safe to assume that the probability of catching a ball at a game is 1/1000? We agreed it was probably something lower, based on the lucky man’s seat location. This is also a great time to talk about the multiplicationrule for independent events, where we agreed that the rule was (for the most part) applied correctly, though with some uneasiness. I’ve reached the point where anytime probability or odds are quoted on the TV news or in a newspaper or magazine, I immediately am skeptical of the claim. I hope I transfer this desire to dig deeper to my classes.